"I'm the captain of my soul. Therefore what I want to do I want to do myself, regardless of what people think that I should do." For better or for worse, the modern memory of Marion Davies is cemented in the character of Susan Alexander in Citizen Kane. The drunken, talentless golddigger character from that classic film has utterly replaced the real-life talented woman Marion Davies was. This documentary takes a stab at righting that wrong, giving us a glimpse of the true Davies. Davies had already embarked on a successful stage career when she met media mogul William Randolph Hearst. Although he undeniably encouraged and helped direct her career, even the non-Hearst newspapers that utterly despised him acknowledged Davies cinematic talents. The documentary demonstrates her skills in both silent and sound films by an extensive set of clips from such diverse works as When Knighthood Was In Flower, The Patsy and Peg o' My Heart, among many others. She demonstrates a flair for comedy, with devastating imitations of Lillian Gish, Pola Negri and Marlene Dietrich. In particular, the documentary credits her as perfecting the first screwball heroine role in The Patsy, predating Claudette Colbert by half a dozen years. Even so, Davies herself would be the first to acknowledge that to a large extent her life was defined by her long-term relationship with the married Hearst. She gave up her still-successful film career, having survived the shift to sound, to take care of him as he fell into ill health in his seventies. Amazingly, despite his reputation as a tycoon, it was Davies who had to bail him out financially on one occasion when a large number of banks coincidentally called all of his notes at once. Especially heartbreaking is the tale of how, while Marion slept under sedation, the corpse of Hearst and every single trace of his existence were smuggled out of her home. The unfortunate part of this documentary, however, is just this central connection with Citizen Kane. In its mission to reverse the erroneous image that has been created around Davies, it seems fixated on the Welles film. It would have been better to devote five to ten minutes to that topic and then let Marion's story tell itself, without constantly making reference to the fictionalized version. But that structural focus issue aside, the documentary is certainly interesting and performs a needed service to rehabilitate Davies' memory. Image Transfer Review: The interview segments generally look fine, although there are some minor aliasing and pixelation issues. More problematic are the film clips; often line structure is evident and substantial pixelation is present. The home movie footage of San Simeon has an odd shimmer that is quite distracting as well. Audio Transfer Review: The sound is fine for the most part in the documentary. There is minor crackling, as to be expected, in the clips from the early sound films. The Quality Street soundtrack is flawless, clean and rich. Extras Review: The primary extra here, to back up the statements regarding Davies' talents made in the documentary, is the 1927 feature Quality Street, an adaptation of the play by J.M. Barrie (Peter Pan). She stars as Phoebe Throssel, in love with Dr. Valentine Brown (Conrad Nagel) in early 19th-century England. When she believes he is coming to propose, he is in fact announcing that he is off to fight Napoleon. When he returns years later, he is shocked to find that the bloom is off the rose and she has become a dowdy schoolmarm. Infuriated at the shallowness of his affections, Phoebe decides to teach him a lesson by impersonating her fictitious young niece Livvie. This costume romance has its definite charms, though it is a bit of turgid going in the first hour (the total duration is 01h:50m:52s). However, once Nagel returns, things move quickly and Davies is highly engaging in her double role, believable in both. This is a notable release, as one of the tiny, tiny handful of MGM silents to be released on DVD, somehow escaping from the greedy clutches of the Time Warner library. Noted silent accompanist Philip Carli provides the piano score. The other extra is a programmed photo gallery that contains 68 stills, a few posters, lobby cards and ads, about a dozen magazine covers and half a dozen cigarette cards featuring Davies. In all, a nicely packed disc. 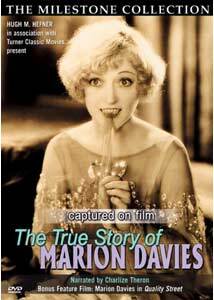 An interesting drama to bring the true story of Marion Davies to light, though it suffers a bit from its emphasis on Citizen Kane. However, a full-length feature does makes for an admirable supplement. Despite some drawbacks to the transfer during the film clips, it's still worth checking out.